Only 3 Years Young! Custom Built with Porches & Decks Galore! Country creole on approx. 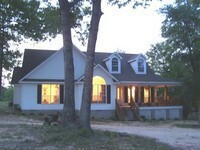 3 acres with wrap around porches and decks! Nice eat-in kitchen with vaulted ceiling, breakfast bar, breakfast area with bay window, and custom cabinets featuring glass doors, and wine and plate racks. Formal dining room with bay window. Large family room has vaulted ceiling, corner stone firplace, and French doors leading to back deck. All bedrooms are nice-sized. Master bedroom with vaulted ceiling, walk-in closet, glamour bath with whirlpool tub and separate jetted shower, and doors leading to back deck.